A Beautiful Ruckus: Happy Halloween 2012!! I'm super excited to share our costumes for this year! If you follow the A Beautiful Ruckus FaceBook Page, then you've already seen a sneak peek. I just couldn't wait to put up the photo! We Dressed Up as Superheros!! I was really pleased with how well the costumes turned out! It took W-A-Y longer than I anticipated to put them together though. I ended up hand-sewing quite a bit on the costumes. Pretty much I either need to learn how to use a sewing machine, or pick something much less complicated next year...I'm thinking maybe I'll cut eye holes in four paper bags and call it good! But it was worth it because the kids were adorable! Click for directions on how to make a Homemade Captain America Shield! Sheesh, Abby had a rough day! I think we have reached that point where she wants her way, and she will let us know when we aren't meeting her expectations. (Some behavior modification is in order because Mama can't handle the wailing long term.) So the tears are not her opinion of her costume! I've added a second photo of her that I took earlier in the week when she tried on her costume so that you can see a happy picture of her. She did calm down once we started Trunk or Treating and definitely slept well that night! Click for directions on how to make a Homemade Tutu Skirt! Sean is our resident comic book authority, so I asked him to pick out the characters for each kid. He chose Robin for Ellie. I was a little confused why she was going to be a boy, but it turns out that every male superhero also has a female counterpart! Huh! You learn something new everyday! So Ellie was Robin, The Girl Wonder who is a "real" superhero, not just one we made up. 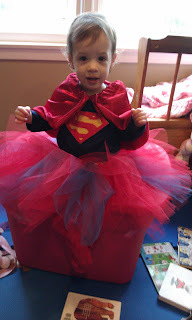 She also loved her costume, but this was the best photo I caught of her. She was way too busy playing and showing it off to hold still for any amount of time. Our first stop of the evening was Uncle Todd and Aunt Ruby's house to show Sean's side of the family the costumes. We tried desperately to get them to pose for a photo with their grandparents but they just didn't turn out. It looks like we are torturing them in every single one, so I'll spare you those. We did manage to get this one that includes Cousin Marissa in her unicorn costume though. Our next stop was church. They had Trunk-or-Treating in the parking lot, and my parents had choir practice inside, so we took the kids in for a quick minute to show off their costumes. Surprisingly, this photo turned out pretty well...and no one is crying! The Trunk-or-Treating was a lot busier than I thought it would be. That's awesome because it is used as a community outreach project! Except...I kind of forgot that we had quadruplets. Laugh if you will, but it's just so normal to me that sometimes I don't think our public adventures all the way through. Let's just say, if I was worried that not enough people would see the kids' costumes, that is no longer a fear! Lots and lots of people saw them. :) We didn't stay too long because of the people and the fact that it was starting to get chilly, but sweet friends from church did have some fun toddler friendly items like fruit snacks that they were holding back for the little guys. So very thoughtful of them to do that! We ended the night by hitting Sonic to take advantage of their $0.50 corndogs. It isn't every day that you can spend $4.00 and buy enough corndogs to feed a family of six! I think Sonic has that promotion every Halloween, and I'd love to start that tradition with our kids. It seems like it would be a fun (and cheap) family memory to create each year! What did your little ones dress up as this year? Head over to the A Beautiful Ruckus FaceBook Page and leave a picture! I'd love to see your family!! Sean's Grandma and Aunt Denise are super sewers they should be able to teach you those sewing skills you need to get started, but from the looks of your costumes you are well on your way. We used a clear plastic garbage bag stuffed with colored balloons one year for a bag of jelly beans, super easy and cheap. Maybe you can steer Sean towards Casper the friendly ghost next year, sheets and holes done. Looks like you will always have lots of fun no matter with so many personalities to play with. The costumes were well worth your hard work! You did an amazing job. Your children looked fabulous in their hand sewn super hero outfits. And with the photos...these memories will last a lifetime. I imagine some day they will proudly tell their friends that their Mom made their costumes from scratch. Well done, Mama! Thank you for the kind compliment! I hope they look back and like them...not think they are silly! Oh how adorable!!! These costumes are so cute! I am loving the superhero theme! Really so cute kids and their dresses are nice on them.